I decided to do some baking the other day but that was as far as my thinking went, so I asked Rob what he’d like. ‘Apple pie’ was his immediate answer, which I thought was perfect given the time of year. I don’t think I’ve ever made this before so I sent him out for Bramley apples – Bramley being the quintessential apple for English apple pie – while I flicked through my recipe books. Now there seems to be a divided camp when it comes to the filling, some cook the apples first and some don’t, which left me with somewhat of a dilemma. In the end I opted for not cooking them first in order to keep some texture. This may have been fine had I chosen a sweeter apple for my filling, or had I put more sugar in. But as it was the pie I’d lovingly made was pretty much inedible as the apples were far too sharp – they needed much, much more sugar than the 4 tablespoons I had used. Disappointed, perplexed and somewhat embarrassed that I couldn’t even make a decent apple pie, I had another attempt the following day, determined to get it right this time. 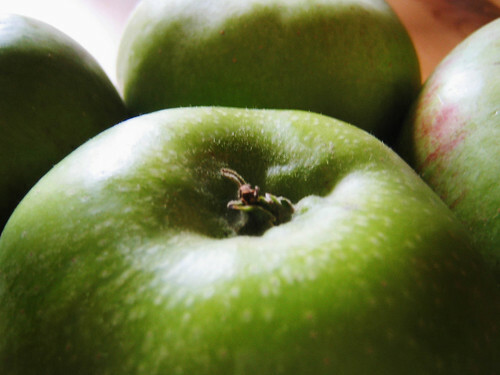 Clearly the amount of sugar needed totally depends on the type of apple used and even then they will vary in taste depending on where and when you buy them. 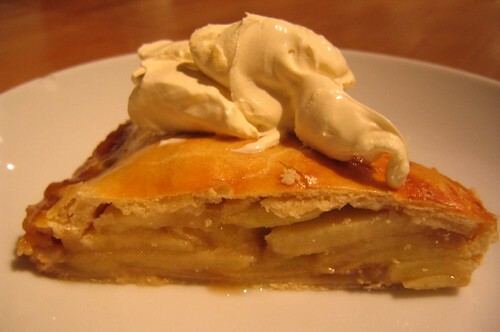 It will also depend on personal taste – some people like very sweet pies, others prefer them more tart. So I figured you either take pot-luck with the sugar or you taste the mixture before it goes into the pie – which means cooking the apples first. I’d moved camps. I was, however, determined not to have mush pie so I decided to compromise and cook the apples just for a few minutes to allow the sugar to coat them and of course I tasted the mixture until I was happy with it. This time the pie was just right. I was happy, as was Rob as he poured on thick cream and delved in. Shortcrust pastry – 250g plain flour, pinch salt, 130g cold butter, chopped. Blend together until it looks like bread crumbs (I used my mixer for this) then add a little water (about 6 tablespoons) to form a dough. Chill for 30 mins in the fridge. Core and slice about 4 Bramley apples and put into a saucepan with a little butter. Add light muscovado sugar and caster sugar to taste along with a teaspoon of cinnamon. Heat until the sugar has dissolved and the butter and sugar are coating the apples. Divide the pastry into two, roll out one half and line your pastry dish with it. Fill with the apples and pour a little of the sugar butter on top, not too much or it will leak out, then roll out the other half of the pastry and top the pie with it. Brush with a beaten egg and bake at 200c for 30 – 40 minutes until the pastry is golden. my dad makes apple pies every year. and prejudiced as I may be, I think they’re best. He makes it like potatoes anna- thinly sliced apples layered up. Every layer gets dotted with butter and every other sprinkled with sugar & cinnamon. Put in a crust and bake as usual. Yum yum yum. Looks good. I have always liked apple pie and now I like it more.